After a thrilling Saturday night game between San Francisco and San Diego, Sharpy and I made our way to Oakland to watch the Bills continue their unlikely playoff quest. The early games were falling Buffalo's way, with Baltimore and Kansas City losing, and we were optimistic as the game kicked off under a bright solstice sky. We had excellent seats for this one, but it didn't matter as everyone stood from the start of the game to the finish. Thus I didn't get many good pictures. 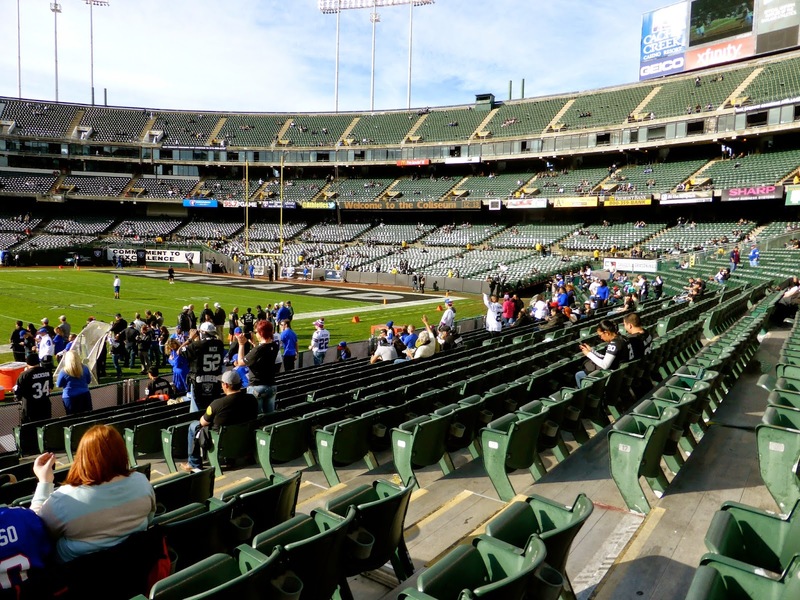 We were in a section populated mostly by Buffalo fans, though those we talked to were all living in the Bay Area now. 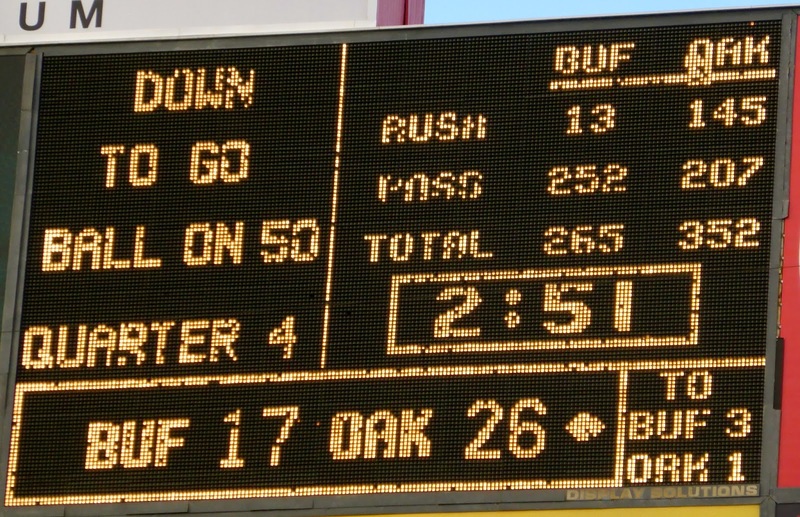 This was the Bills first visit to Oakland since 2005. The Raiders were improving having defeated Kansas City and San Francisco in recent weeks, and the Bills were coming off a huge upset over Green Bay before a visit to New England next week. These "gimmes" are known as trap games, but the Bills showed no ill effects early, stopping Oakland on three plays and then scoring on a beautiful 42-yard pass from Kyle Orton (above) to rookie Sammy Watkins (below). That the was high point of the day, coming about an hour before the low point (the winter solstice that is, the lowest high point of the sun in the sky). Oakland could get nothing moving, going three and-out on their first three possessions, but Buffalo did not take advantage. Orton was intercepted on the Bills second drive and briefly intercepted on their third, but that was overturned after review. 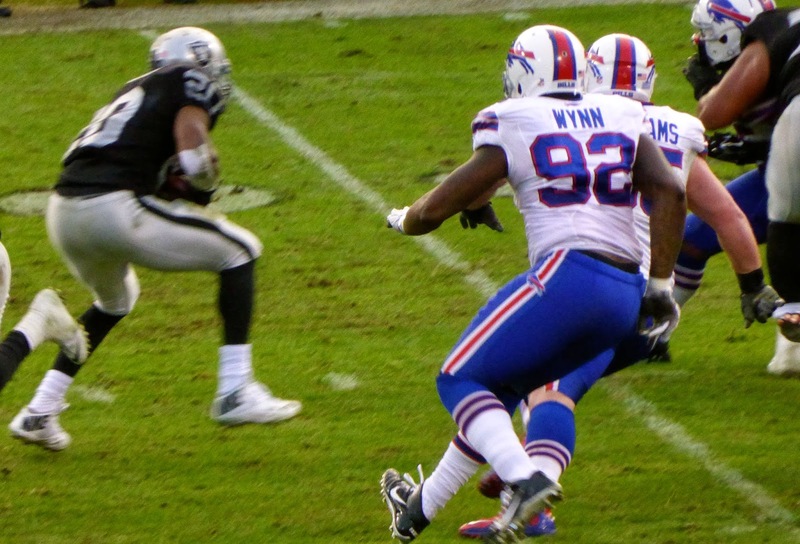 The Raiders finally got a first down on their fourth possession when Derek Carr (below) found Kembrell Thompkins for a 13-yard gain, and later on the drive, the two connected for a 50-yard bomb that put the Raiders on the Buffalo 4-yard line. The first play of the second quarter saw Carr toss a short TD pass to James Jones and the game was tied at 7. After Buffalo went three-and-out, the Raiders began another drive with a handoff to Latavius Murray. 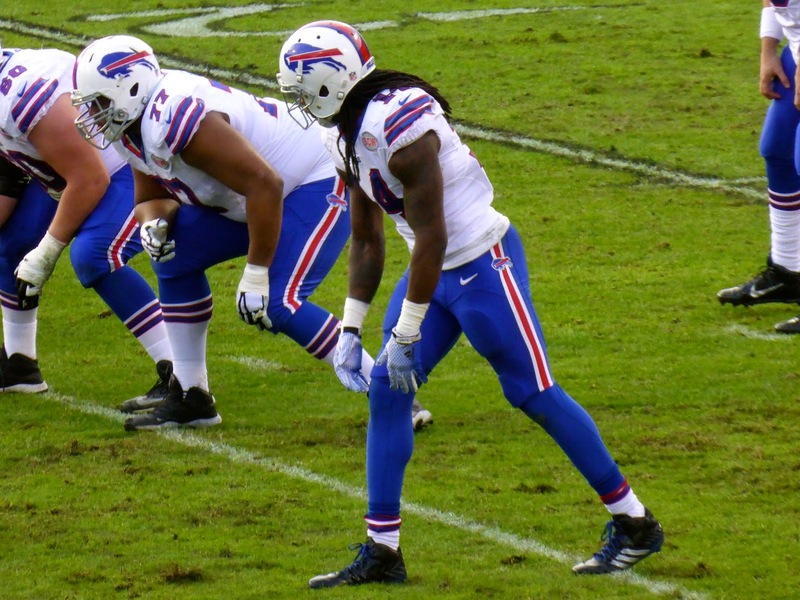 He was tackled by Marcell Dareus, who was injured on the play and had to leave the game. 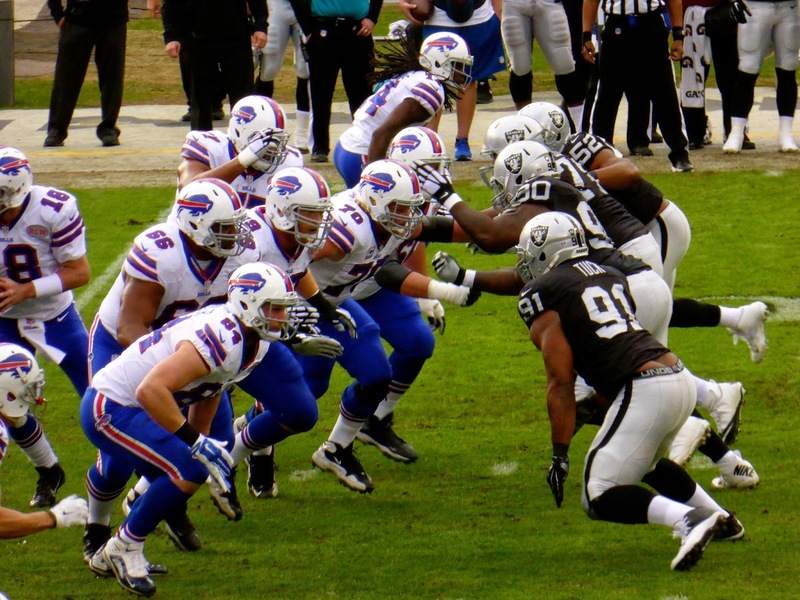 That was the turning point as the Raiders soon established a strong running game, taking advantage of the Bills depleted line. Football teams may have 46 players on game day, but one injury is all it takes to turn a strength into a weakness. The only friend the Bills had was the replay official, who again ruled in their favour when Robert Woods fumbled after catching a ball over the middle. The lengthy review ruled the play as an incompletion, but it mattered little as the Bills punted yet again. After that, Oakland began to run the ball with some consistency, getting close to the Red Zone before bogging down, leading to a couple of field goals from Sebastian Janikowski. 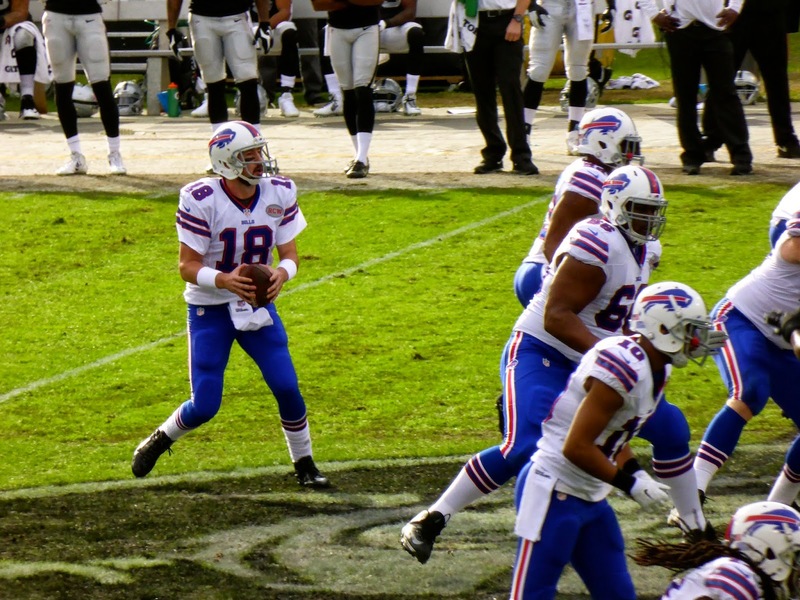 The Bills replied with one of their own as the half ended with the visitors down 13-10. Buffalo did nothing on their first two possessions of the second half while Oakland managed two more field goals, running 19 plays over 8 minutes and extending the lead to 19-10. When the fourth quarter began, Orton found Scott Chandler over the middle for a 29-yard score and the Bills were still alive, down 2. They managed a defensive stop and took over on their 14, gaining two first downs but punting on a 4th-and-1 from their own 46 with 8:22 left Given their inability to move the ball, it is hard to second guess the decision to punt, but ultimately it cost them the game. 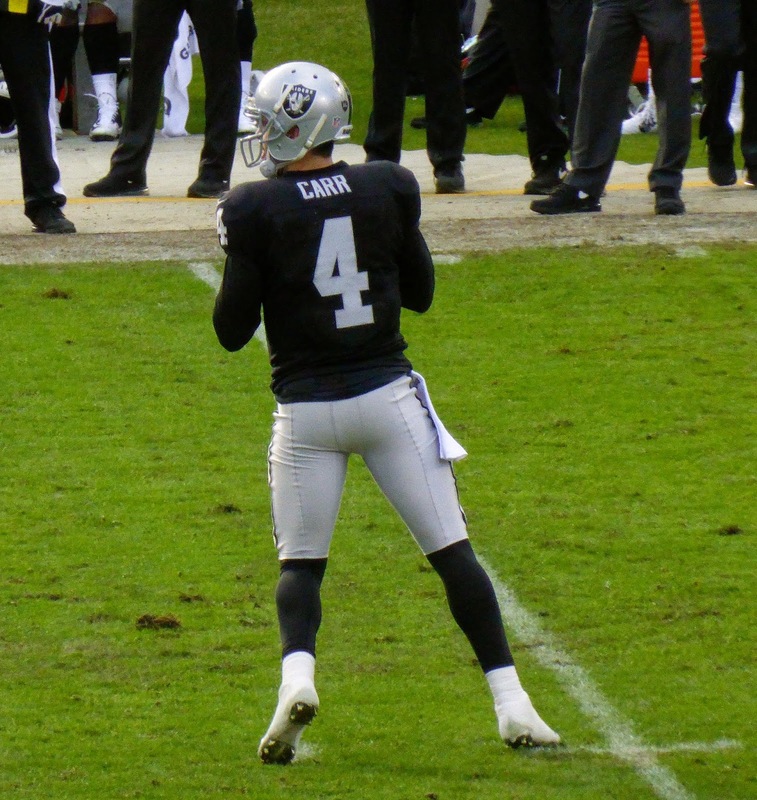 Carr showed poise in calmly leading the offense through a balanced mixture of runs and passes, with the key play a 25-yard dash by Darren McFadden (above) that saw him pushed out of bounds at the 1. The next play saw Carr connect on a pass to Jamize Olawale to make it a two-score game (below). The drive took 5:22 off the clock, giving the Bills little time for a miracle. On their next possession, Orton overthrew his receiver and Brandian Ross accepted the early Christmas gift, essentially ending the game. Extremely depressed, being either mocked or pitied by the Raiders faithful (it hurts when fans of a 3-12 team pity you) and with red-eye flights to catch, we left at this point, breaking one of my rules. Following the game online, I saw the Bills use their remaining timeouts and the two minute warning to stop the clock, and then Janikowski missed a field goal, keeping Buffalo within 9. A garbage-time touchdown drive later and there was a brief moment of hope, but the onside kick was recovered by Oakland, ending the meaningful portion of the Bills season. Fifteen consecutive years without a playoff berth and without a first-round pick in the upcoming draft, the early season excitement has again reverted to elimination ennui. I am 0-6 when watching the Bills and will now accept donations from any opposing fans to attend Bills games that your team needs to win. Other than some games in New York, there's not much to see in the next few months. With Club 122 opening no new venues in 2015 (other than the Islanders in Barclays Center, which doesn't require me to leave town), I'm planning a few international trips instead, including visiting the Barbados in May for some English cricket and a return trip to London in October for the Rugby World Cup. A January trip to Iceland and Denmark should net at least one hockey game, but it won't be until baseball season that I start to get busy again. I plan to see the Blue Jays in Houston for a 4-game set in May along with several minor league parks, and then see their interleague battles in Washington and New York in June. I also want to revisit Nashville for their new AAA ballpark. A possible CFL road trip lurks in the background. I'll be posting my tentative 2015 schedule in a few days, so check back to see what is on tap.